Jim Evans at SuperYachtsMonaco sends news of a further €400,000 price drop on his central listing, the 29.83m motor yacht Leonardo II. Built by Azimut in 2004 as one of the yard’s Leonardo 98 series, Leonardo II has had the same owners since new and has been carefully maintained. Four staterooms sleep up to nine guests and twin 2000hp MTU engines power her to a maximum speed of 25 knots. 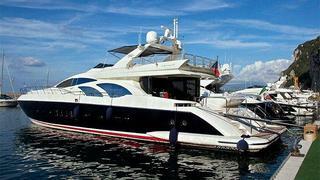 Available to view in the South of France, Leonardo II is now asking €1.5 million.